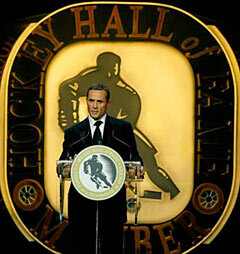 Steve Yzerman played over 1,500 games in the NHL as a member of the Detroit Red Wings. 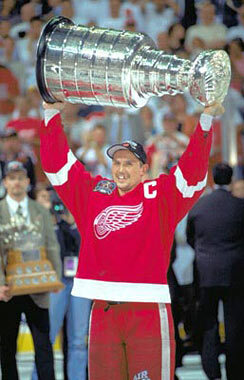 At the time of his retirement in July 2006, Steve Yzerman had earned his place as one of the greatest Detroit Red Wings of all-time. He ranked third to Gordie Howe and Alex Delvecchio in games played as a Red Wing, second to Gordie Howe in goals scored and points and finished first in franchise assists. His sweater number 19 was synonymous with greatness, and in an elaborate on-ice ceremony, on January 2, 2007, the Detroit Red Wings retired Yzerman's number. Before that game against the Anaheim Ducks on a cold winter night at Detroit's Joe Louis Arena, the Red Wings honoured their long-time captain. The retirement ceremony was hosted by former NHL goalie, Darren Pang. Joining in the festivities were Steve's wife Lisa and their three daughters, Isabella, Maria and Sophia. Also present were former Red Wings' Alex Delvecchio, Gordie Howe and Ted Lindsay, the three surviving Wings who have had their numbers retired by the team. Also on hand were Scotty Bowman and Vladimir Konstantinov, who gingerly walked across the ice surface for the first time without a wheelchair since the horrific accident that followed the 1997 Stanley Cup championship. During the ceremony, the current Red Wings wore Yzerman retro jerseys, representing the Detroit Red Wings, Team Canada at the 2002 Winter Olympic Games, the Campbell Conference All-Star Team and his junior team, the Peterborough Petes. The captain's 'C' was included on the corner of his banner to forever commemorate Yzerman as the ultimate captain, a sight the fans observed as Steve raised the banner to the rafters of Joe Louis Arena. "The reason I chose number 19 was because of number 19 on the New York Islanders, Bryan Trottier," Yzerman explained. "I wore the number in his honour. He was the player I looked up to and admired."